Apparently there's a mall in Seoul where shoppers can ponder the biomechanics of The Incredible Hulk relieving himself, an act that requires a seismologist, an eight-person hazmat squad, and a charm of soothing from Dr. Strange. Add this to the list of unsanctioned superhero public art around the globe. 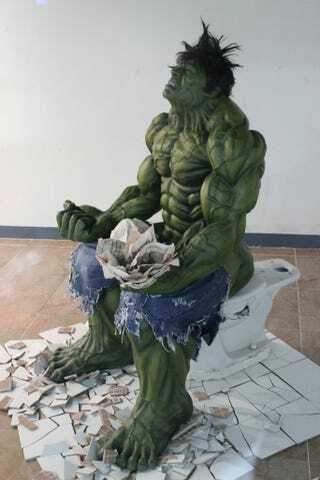 Semi-Related: Hulk comic book toilet paper.